One of the largest temples of Saint Petersburg, Trinity Izmailovsky Cathedral was solemnly founded in 1828 on the holiday of Holy Trinity. It replaced the ramshackle wooden regimental church for Izmailovsky Regiment. Glorious Izmailovsky Regiment was one of the oldest guard regiments in Russia — it was founded under Empress Anna Ioanovna in 1730 in the village of Izmailovo it was named after. The construction of the new cathedral was entrusted to architect Stasov who designed a project in the late Classic style. Less than in 10 years the cathedral was constructed, and in 1835 it was consecrated. Officially the temple was called Trinity Cathedral of Izmailovsky Life Guard Regiment, but people called it Izmailovsky, for short. The large five-domed white cathedral became one of the most impressive constructions of that time. The huge shape of the cathedral immediately took the dominant position in the Fontanka panorama. And even nowadays its bright-blue domes that once were adorned with stars can be seen from the distance of 20 km. Outside the cathedral is decorated with four porticos of Corinthian columns and sculptural frieze. In the niches there are bronze figures of angles created by sculptor S. Galberg. The impressive cathedral can house up to 3 thousands of believers at once. The cathedral treasured trophies won in the battles of Russian-Turkish War of 1877-1878. To commemorate the deceased officers of Izmailovsky Regiment the walls of the cathedral were covered with memorial plaques with the names of the heroes. In 1886 in front of the cathedral the monument Column of Glory, designed by architect D. Grimm, was erected. It consisted of several tiers of captured Turkish cannons. On the granite pedestal of the column that was crowned with the figure of Glory the bronze plaques with the listing of the battles and deeds of guardsmen of Izmailovsky Regiment. Unfortunately, in the 1930s Soviet Authorities considered this monument of Russian Glory to be a «symbol of Russian militarism». Besides the column was the hindrance for the traffic. As a result, the monument was dismantled. 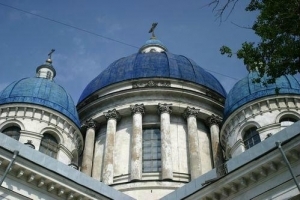 The rich history of Trinity Izmailovsky cathedral features a plenty of memorable events. On the 15th February 1867 in this cathedral Dostoevsky married Anna Snitkina, who became writer's guardian angel. On the 6th of November 1894 the burial service over prominent composer and pianist A. Rubinstein was read in Trinity Izmailovsky Cathedral. The revolution of 1917 marked the beginning of the most dramatic period in the history of the cathedral. The temple was desecrated and plundered. At first Soviet authorities planned to demolish the cathedral, than there was a blasphemous project of turning the cathedral into a crematorium. Luckily both these projects weren't fulfilled. For a long period of time the cathedral served as a storage-house. That caused the great damages to the cathedral's interior and exterior. Trinity-Izmailovsky Cathedral war returned to the believers in 1990 but the restoration works haven't been complete yet.